It’s hard to believe that 2018 is already half over! I hope you are enjoying your summer and all life has to offer. I’d love to hear of any fun adventures you’ve taken! The second quarter of 2018 brought mixed results with slower but continued growth in the U.S. and falling international markets. Like last quarter, there was no place to find a smooth ride as volatility was still high. After a slight loss last quarter, the S&P 500 has returned to positive territory with a 3.4% total return for the quarter. Here in the U.S., the bright shining star for stocks was the Russell 2000 Index (small caps) which posted a 7.75% return for the quarter and 7.66% for the year. Meanwhile, the rest of the world is beginning to feel the squeeze of slowing growth, and headlines that kept market volatility up as a looming trade war hit international markets the hardest. Higher energy prices, a stronger dollar, and trade worries are all headlines that helped push emerging markets to a -7.9% loss for the quarter – taking back a portion of the 37% gain the asset class enjoyed last year. On the note of higher energy prices, oil turned in a 14.5% return for the quarter and 22.7% for 2018 as demand picks up. The price for crude has risen sharply (now up to $74 a barrel); the price increase is being seen at the pumps as well. Stepping back for a global view, the U.S. economy is currently the bright spot while foreign economies are struggling. China’s economy is slowing and combined with a developing trade war with the U.S. has caused it to be the worst performing market of 2018 down 20% from its peak. In Europe, they have enjoyed strong growth over the past few years, but at the expense of artificially low (or negative) interest rates. They are now faced with the need to raise rates before this credit cycle (more on that in a minute) comes to an end. If they do not, they will be hard pressed to fight the next economic downturn. Speaking of economic downturns, where does all of this leave us? Not only are the markets showing mixed results, but so are the economic indicators. But, before I begin sharing my thoughts, you know I will be the first to tell you that you can never time the markets, nor should you try – you’ll lose nearly every time. However, that doesn’t mean you shouldn’t study why things work the way they do and make adjustments as necessary. In my previous letters, I have been a strong advocate of the fact that the markets were not overvalued, citing interest rates among other economic factors for my reasoning. So far, I have been correct. This current expansion which started in March of 2009 (the low point of the financial crisis) has now lasted 108 months. During that time, the S&P 500 has enjoyed a 302% gain while the economy trudged along at an average of 2.2% growth over the same period (which isn’t that good by the way). Compared to previous recoveries it has been very anemic, to say the least (see the chart to the left). As I have noted before there are three major factors that drive our economy. First is productivity, the second is the long-term debt cycle and the third is the short-term debt cycle. Over time, knowledge, skills, technology, and investment (putting capital to work) increase which in turn increases productivity. As an economy’s productivity increases, so does the general standard of living for its people. (Remember an economy is just a group of markets and each market is just a collection of transactions. As this long-term cycle progresses (between 50 and 80 years) more and more transactions are settled with credit than with money, which is unsustainable. Eventually, the creditors actually want the money they were promised and the house comes crashing down. Long-term debts cycles are made up of many short-term (7 to 10 years) debt cycles (also known as the business cycle). In each cycle spending with credit is self-reinforcing, as spending increases, so do incomes, which creates rising net worth, which raises the borrower’s ability to borrow, which allows more buying and spending – with credit. You get the idea. Since debt can’t rise faster than actual income (receipt of money) forever, there are limits to the amount of growth that can happen with debt and then there must be a deleveraging (a recession). 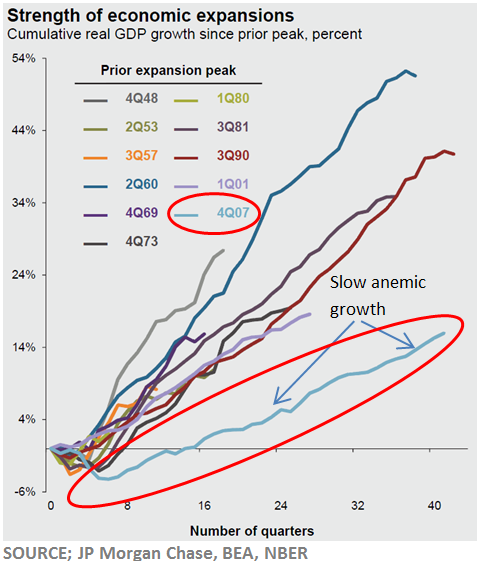 Each short-term cycle builds on the one before until the whole thing is completely unsustainable and you have the end of a long-term debt cycle (think 1929 and yes you guessed it, 2008). For geeks like me, debt cycles are a fascinating historical study that I would encourage you to dive into if you are so inclined. While there is no clear-cut way to determine when one cycle ends and another begins, you can track the shifts. Last year at this time, I was saying that it finally seemed like we had shaken off the weight of the previous debt cycle and the economy had legs to run on. And it did! Which brings us to where we are in the current short-term cycle. As for where we are today, I still believe the economy has room to run, though it is beginning to show its age. That being the case, I will share with you just some of the items I keep an eye on. One factor to pay close attention to is, you guessed it, interest rates. Since economic cycles are driven by debt spending, interest rates play a huge role. That’s why we spend so much time looking at them and studying how they impact our investments and financial plans. 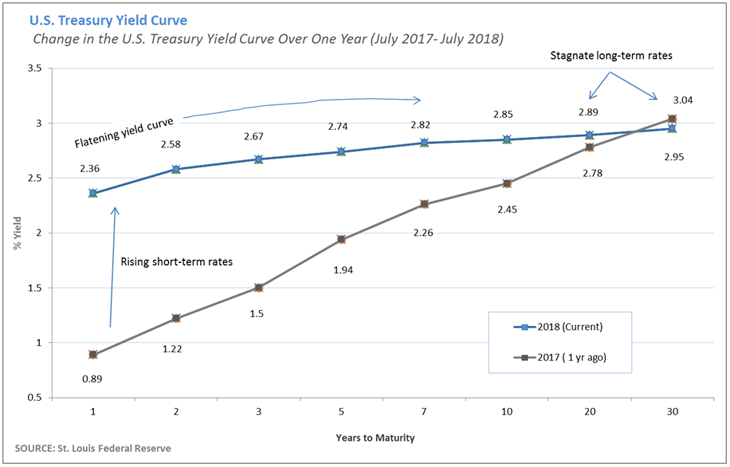 One benchmark for interest rates is the U.S. Treasury Yield Curve, which is the current yield on U.S. Treasuries (bonds) at various maturities plotted on a graph (see below). It lets you compare the yield on short-term bonds verse long-term bonds. A normal or typical yield curve slopes upward and to the right because bonds that have longer maturities should have a higher rate since it’s riskier to hold a bond for 30 years than for one. The yield curve is said to flatten when yields on short-term maturities are close to that of longer-term issues. Historically this has been a harbinger of the end of a debt cycle and a recession. Keep in mind though it’s not a perfect predictor. So what can we learn? Why would the yield curve flatten? A significant reason would be the Federal Reserve raising its Federal Funds Rate (the rate at which banks lend to each other). Banks then use this rate to set all other rates including the prime rate, which is the rate banks use for their best customers. Other rates are directly or indirectly influenced by the prime rate. So, as the Fed raises its Federal Funds Rate, typically all other rates will rise as well. Again, since there is so much credit in our economic system, the Fed raises or lowers its funds rate in an effort to increase or slow down production. People and companies think harder about borrowing at higher and higher rates. The Fed began raising rates in earnest this time last year because they had to. If they didn’t, with rates as low as they were, they would have had little to no ammunition to fight the next recession. The action has caused short-term rates to soar. An important gauge is the difference between the 10-year treasury and the 2-year. Last July the difference was 127 basis points (bps). (100 basis points is the same as 1%). Now, the difference is a mere 27 bps. That’s quite the change in a years’ time. If you’ll remember, our working thesis is that lower rates have helped justify higher stock market prices. With rates rising as quickly as they are, this could begin to shift in the other direction. We’re not quite there yet, but it’s worth keeping an eye on. Another, factor to watch is production (GDP – how much output we are producing). Remember we said production was one of the main factors that drive the economy. There is a measure known as the GDP Gap. The gap measures the difference between the actual output of an economy and its potential output. An economy’s potential output is the maximum amount of goods and services an economy can turn out when it is efficiently using all of its resources (raw materials and workers). The gap is said to be zero when an economy is running at capacity. 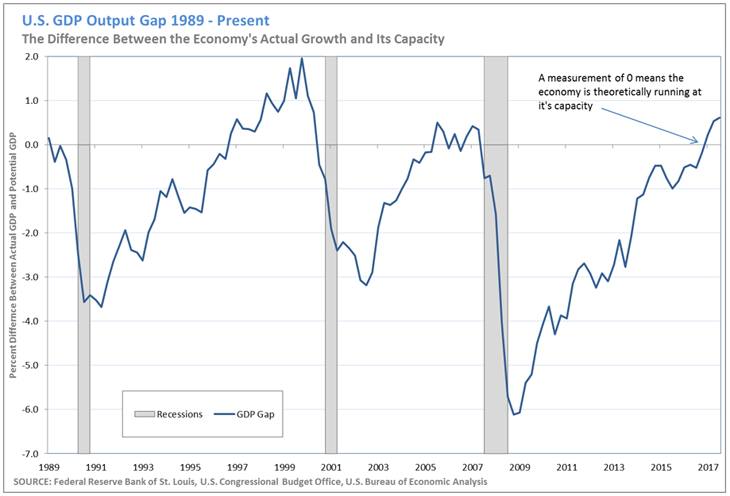 The chart below shows that our economy is currently running above capacity. In fact, I cannot tell you how many business owners I talk to who say they can’t find people to fill the jobs they have. 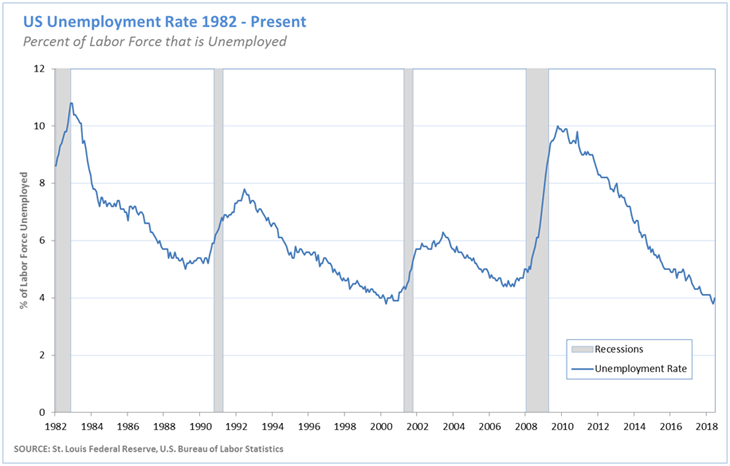 The national unemployment rate is currently at 4% (see the chart below): a level last hit during the late stages of the Tech Boom of the 1990’s. A fully employed labor force is great; everyone has a job that wants one. However, when there are not enough people to fill jobs, companies begin raising wages and benefits in hopes of attracting needed employees. That makes it more expensive to do business which is then passed along in the price of the goods and services they produce. As prices rise, each dollar you have cannot buy as much as it once did and you have price inflation. Inflation (unfortunately) is a necessary part of our credit-based economy. What we do not want to see is inflation rising quickly while the economy is running at capacity. 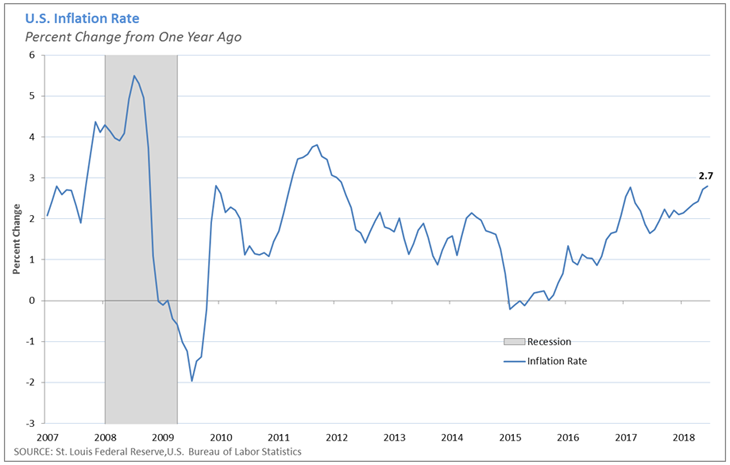 The chart below shows the U.S. inflation rate since the beginning of 2007. Notice the trend upward since 2015. My intent here is not to sound alarm bells, but to make you aware of various measures that help us know where we are in any given debt cycle. The items I have mentioned are just some of the items I monitor all of the time. They are also leading indicators, meaning it will be a while before their effects are seen in the actual markets and economy. However, they are markers and if we are aware of the trends that set the longer economic course, we can be better prepared in our portfolios and elsewhere. One thing we are not going to do is sell everything and wait for the “shoe to fall”. This cycle still has life left in it. Many other parts of our economy are showing signs of great strength. For example, light truck sales have been rapidly growing in recent months, a sign of employed workers and the confidence of the companies that employ them. New housing starts continue to rise, and so do new orders of capital goods (materials companies need to make other products). The markets will make further advances (although I think at a slower pace than we have seen, mostly due to interest rates) as the economy continues to do well, and we want to be there to capture the return. I wish we had a crystal ball and we could know exactly when the markets would turn, but we don’t. What we can do is be vigilant, capture the returns that are there and not take on too much risk. The biggest item in my mind is to be watchful of interest rates and the yield curve. More than anything we’ve discussed here, interest rates can quickly have a big impact. Again my goal is not to sound alarm bells, but to share with you some of the early fundamental shifts I see in our economy. It is my hope that if you are armed with knowledge and understanding it may help you make better personal and business financial decisions going forward. Also remember that we knew there would be good times and bad times and we’ve built your financial plan and investments to deal with them both. As always, please feel free to reach out with any questions you may have as we navigate this journey together. This entry was posted on Wednesday, July 18th, 2018 at 10:45 pm	and is filed under Markets, Quarterly Insights. You can follow any responses to this entry through the RSS 2.0 feed. You can leave a response, or trackback from your own site.